For thirty years after the building of the Church in the mid 1960s the wall behind the altar remained a plain white void. 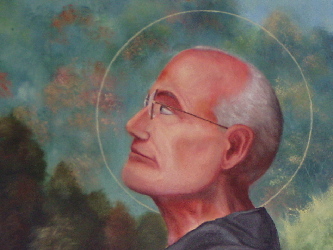 Today it boasts a magnificent mural, commissioned by Father Jacek Trochim, and painted by twins Mark Kaiser and Paul Kaiser between August 1995 and May 1997. 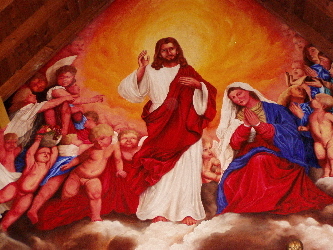 The mural depicts Christ in Glory with the Mary, Mother of God and Queen of Poland, above an earthly landscape which is obviously Polish and which, amongst much else depicts the famous Polish shrine of the Monastery of Jasna Gora and life size representations of Pope Jonh Paul II and Saint Maximilliam Kolbe. 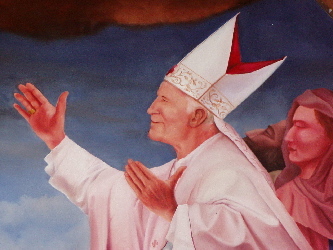 Since its completion the mural has excited considerable interest and media publicity and has been the centerpiece of visits by both Archbishop Wesoly, who at that time was responsible for the vast Polish community outside Poland, and the Archbishop of Birmingham. This magnificent mural is an outstanding contribution to devotional art at the end of the 20th Century. Hopefully it will inspire visitors for many years to come. 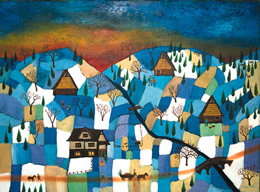 The paintings are "A cup of hot chocolate at Morskie Oko, Poland" and "Cheese-smoking huts, Poland". 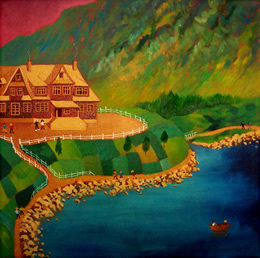 You can find more of Mark's work at his online Gallery. The First is of the Polish Tatra Mountains and the other is of India. "Wow!! What a lovely site!! Little did we know when we were painting the mural back in 1996 that it would be on the internet years later!! 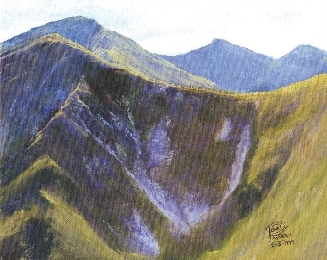 And what a great time we had from drawing those first sketches, through to clambering up the creaky scaffolding and then applying the first brushstrokes. Although I was living up in Yorkshire at the time and Mark was in London, we met up in Kidderminster every weekend for a year and a half in order to complete this religious masterpiece, often working through the harshest of winters and the warmest of summers. It was quite an experience and we knew how Michelangelo must have felt!! The congregation also used to bring us food and drink and one parishoner even brought us 'Placki' which he'd made especially for us!! If you also look to where the yellow beams meet the mural, we've actually painted ourselves in as 'Cherubs' both holding up the beams and helping to 'support the church'. Meeting 'Archbishop Wesoly' was a great experience, I mean its not every day that you meet a Polish Archbishop from the Vatican!! Also Mark had a great idea of presenting him with a framed photo of the painted Pope in order to present to none other than Pope John Paul II himself. When the local press arrived to take photos of the finished mural, we must admit that we didn't expect it to escalate further, but it appeared on ITV's 'Central News' and was seen by a million or so people!